As someone who thinks Obama is still the best bet for real change in this election, I kept feeling underwhelmed by his performance. You wait for him to go in for the kill ... and ... he ... never ... quite gets there. He seems to be possessed of an almost pathological high-mindedness, and an inability to encapsulate his arguments in ways that get traction against his opponents. . . . Goddamn it: stop being so fricking reasonable and above it all. To his credit, Obama wants to be a world-historical president. He wants to be transformative. He wants to be an FDR. A Kennedy. Even a Reagan. He wants to be what Bill Clinton could have been. He wants to usher in a new age, a new paradigm, and a new coalition. Like many intellectuals before him, however, Obama is losing himself in a false romantic narrative of the mythical "Great Presidency." Instead of acting -- instead of seizing the existential moment -- he is trying to emulate how these presidencies are remembered in the popular mind. He’s seeing what we today remember about FDR and Kennedy’s challenges to the nation, about Reagan’s public optimism, etc. And he’s trying to mimic that through high-minded nobleness. This is bad. "In an effort to quell growing doubts in the Senate about his nomination as attorney general, Michael B. Mukasey declared Tuesday that waterboarding and other harsh interrogation techniques “seem over the line or, on a personal basis, repugnant to me” and promised to review the legality of such methods if confirmed. But Mr. Mukasey told Senate Democrats he could not say whether waterboarding, which simulates drowning, was illegal torture because he had not been briefed on the details of the classified technique and did not want to suggest that Central Intelligence Agency officers who had used such techniques might be in “personal legal jeopardy.”"
Call it “Chinese Water Torture,” “the Barrel,” or “the Waterfall,” it is all the same. Whether the victim is allowed to comply or not is usually left up to the interrogator. Many waterboard team members, even in training, enjoy the sadistic power of making the victim suffer and often ask questions as an after thought. These people are dangerous and predictable and when left unshackled, unsupervised or undetected they bring us the murderous abuses seen at Abu Ghraieb, Baghram and Guantanamo. No doubt, to avoid human factors like fear and guilt someone has created a one-button version that probably looks like an MRI machine with high intensity waterjets." Imagine what we would think of a country where candidates for high office and nominees for the highest law enforcement position in the country had earnest debates about whether or not the rack was torture ("hey, I do stretching exercises before I go jogging, and it doesn't hurt me! "), or whether disembowelling living prisoners shocked the conscience ("I had my appendix out, and I'm doing just fine!") We would think that the people who said such things had utterly lost their humanity. Yet for some reason, altogether too many of our fellow citizens seem to think that it is perfectly acceptable for politicians and their appointees to have the same debates about waterboarding. I suspect that future generations, and the current inhabitants of other countries, will regard this the same way we would regard people who took it to be an open question whether the rack was torture: with abhorrence. "We live at a time where Americans, completely uninformed by an incurious media and enthralled by vengeance-based fantasy television shows like “24”, are actually cheering and encouraging such torture as justifiable revenge for the September 11 attacks. Having been a rescuer in one of those incidents and personally affected by both attacks, I am bewildered at how casually we have thrown off the mantle of world-leader in justice and honor. Who we have become? Because at this juncture, after Abu Ghraieb and other undignified exposed incidents of murder and torture, we appear to have become no better than our opponents." "The nation’s top official for consumer product safety has asked Congress in recent days to reject legislation intended to strengthen the agency, which polices thousands of consumer goods, from toys to tools. The measure is an effort to buttress an agency that has been under siege because of a raft of tainted and dangerous products manufactured both domestically and abroad. In the last two months alone, more than 13 million toys have been recalled after tests indicated lead levels that sometimes reached almost 200 times the safety limit." Let's be clear what we're talking about here. The Consumer Product Safety Commission is what it says: the government body "charged with protecting the public from unreasonable risks of serious injury or death from more than 15,000 types of consumer products under the agency's jurisdiction." If your baby's crib has a malfunction that could kill your child, if your child's toys are covered in lead paint, or if their BB guns have a defect that "caused at least 15 deaths and 171 serious injuries, most of them involving children", this is the agency charged with investigating and mandating recalls. Having an agency that does this, and that does it well, ought to be a no-brainer. Personally, I have no real desire to be protected against the possibility that I might try to use my toaster oven in the bathtub, or use my Cuisinart to trim my nails. On the other hand, I would very much prefer to be able to buy a toy for my nephews without having to personally test it for lead paint, or for other potentially lethal hazards that are hard for individual consumers to detect. In theory, the purpose of the Consumer Product Safety Commission is to give me that confidence. "Mr. Moore, the commissioner appointed by Mr. Clinton, told Congress in March that it would take years to recover from the loss of employees with expertise in toys, fire-related hazards, drowning prevention and chemical risks, among others. At the agency’s product testing lab, which operates out of a former missile defense radar station in Gaithersburg, Md., the impact of the tight budgets is apparent. One lab worker used a magnifying glass and a mechanical stop watch to help conduct a fabric flammability experiment — the same equipment she has used for three decades. The toy laboratory, down the hall, is an office so cramped that the only space dedicated to a drop test to see if toys will break into small pieces and cause a choking hazard is the spare space behind the office door. 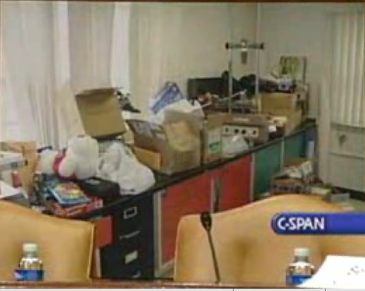 “This is the toy lab for all of America — for all of the United States government!” said Robert L. Hundemer, the one agency employee who routinely tests toys, as he held up his arms in the air. 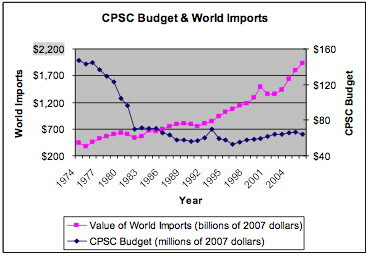 “We do what we can.”"
Heavens: looking at that spacious lab, with all that shiny new equipment, I can't imagine what the CPSC would do with a budget increase. Can you? Ladies and gentlemen: your Republican Party in action. "Over the objections of the Bush administration, a Senate committee unanimously adopted sweeping legislation on Tuesday that would extend the authority of the Consumer Product Safety Commission and sharply increase its budget and staff." Obama’s new Social Security line of attack against Clinton is not merely a horrendously bad idea itself. It’s bad enough to make people like me (tentative supporters) question whether his campaign has the political smarts for prime time. I won’t repeat the arguments because others have made them so well (see Garance, Josh Marshall, and especially Atrios). I’ll just add a few more observations. First, the real opening here is for Edwards. If she were so inclined, Clinton could knock Obama out with a quick, powerful attack from the left -- “he’s repeating Bush talking points on Social Security after all we did to save it.” She won’t do that though, largely because Obama is right on some level -- she doesn’t intend on getting specific. Which is fine by me, because I’m firmly in the camp that Social Security isn’t a problem. There’s nothing stopping Edwards, though, from shifting his cannons. Obama voters are fertile ground for him. Indeed, Edwards and Obama are fighting for the type of anti-Hillary voters that would be most upset by Obama’s actions. A strong attack would also draw some real blood within the blogosphere, which would cheer Edwards on. Also, elderly Iowans might have a particularly strong interest in Edwards' attacks. Second, the really troubling part of this is not so much the Social Security message itself (which is bad), but how it reflects on Obama’s political instincts. As others note, the false sense of crisis was the single-biggest threat to the wildly-successful Social Security system. It’s also the crown jewel of the liberal blogosphere’s mighty, mighty empire. As Atrios notes, rightly or wrongly, “we” feel like we played an important role in saving Social Security – primarily by beating back these misperceptions. Obama is therefore not only substantively wrong, he’s also insulting liberal online activists in a very deep and meaningful way. I’m sure, of course, his campaign didn’t think of it that way. They probably thought this would turn the Russert/Broder class against Hillary, and didn’t factor in the scars of early 2005. But again, this itself is a problem -- indeed, Obama’s crappy netroots outreach may actually cost him this time. Here’s some free advice -- abort mission. There’s an opening to attack Hillary -- it’s called Iran. Use it. It's an important issue. It's a real crisis. But this stuff, well, this needs to stop. This is the problem with taking campaign cues from the press. . . . This is what happens when campaigns are trying too hard to win news of the day stand-offs, and not enough about directing things long-term. Via (man or machine?) Benen, I saw the Huckabee Risin’ poll in Iowa. Ana Marie Cox threw cold water on the methodology, but even fundraising indicates Huckabee is getting stronger. Stronger, though, is not necessarily strong. And I still don’t see him as a viable candidate. What I do see him as is a viable spoiler for Mitt Romney, and thus Rudy’s MVP. Romney continues to lead big in Iowa, and ultimately wins convincingly. Much to Romney’s dismay, however, the big story out of Iowa is Huckabee’s better-than-expected second-place finish. Pundits looking for a narrative that makes them sound interesting and insider-ish will focus on Huckabee over Romney. After all, everyone’s known for months that Romney would win. That's boring. We need fresh. I can hear it now – Is this Clinton in 1992? Is Huckabee for real? Could evangelicals get behind Huckabee? And on it goes. Huckabee still won’t have much money or recognition. His second-place finish will, however, be a giant opportunity cost for Romney, robbing him of the precious post-Iowa buzz he needs to win. (Similarly, the Dean Scream arguably hurt Edwards by forcing him into Third-Biggest-Story-in-Iowa status in 2004). The Huckabee diversion will also be a godsend for Rudy, who just needs to avoid a Tyson-like early-round knockout that could come from Romney’s Iowa-New Hampshire snowball. Utter speculation? Of course -- but even non-Pajamas Media bloggers speculate from time to time. Still, I think it’s a very plausible situation. In fact, it’s sort of already happened. Romney’s “purchase” of the Iowa straw poll was intended to generate buzz and a sense of inevitability. The story I kept hearing, however, was that Huckabee did better than expected -- for far less money. When you think of media buzz in terms of opportunity costs, Huckabee’s post-straw buzz probably harmed the Romney camp. Only slightly this time, but you could see the future earthquake from these tremors. While I was off being busy, I kept meaning to comment on the Blackwater story, but never found the time. It seems pretty clear to me that the main problem is not individual trigger-happy contractors but a larger structural point: the absence of any legal framework for holding contractors accountable*. This is something the administration and Congress could have and should have tried to remedy long before now, but even though Rep. David Price and Sen. Barack Obama introduced legislation to do this months ago, Congress has not yet acted**, and the administration seems to have had no interest in this question at all. More importantly, though, the Blackwater episode makes it clear that whenever someone proposes privatizing something, we need to think hard about what privatization would mean in the specific case under discussion, rather than just assuming that privatization is good or bad, period. Privatization is not a one-size-fits-all solution to all our problems. I am all in favor of the private operation of, say, supermarkets, and if they were presently run by the government, I would be all for privatizing them. But introducing private soldiers into a war zone is a different matter entirely. They are not governed by the laws that govern the military. They do not have the same mission as the military, and when (for instance) the best way to ensure that a diplomat gets from point A to point B safely is to shoot anyone who gets in their way, they have no need to ask themselves whether this might run counter to America's overall strategy or interests. In this case, privatization seems like a straightforwardly bad idea. To illustrate the importance of paying attention to the details, here's an excerpt from Betraying Our Troops: The Destructive Results of Privatizing War, by Dina Rasor and Robert Bauman. It's about how one rather important difference between private contractors and soldiers -- that private contractors can engage in work stoppages while soldiers cannot -- almost caused very serious problems for our troops. This is exactly the sort of detail that people ought to think about when they're asking whether or not some function should be privatized. Unfortunately, this administration seems to treat it as a given that privatization is a good thing no matter what. Here's how this attitude almost got out soldiers into serious trouble. "The Army's logistics contract manager at the camp could not believe what he was hearing. A KBR manager reponsible for supplying the troops in this camp with fod, water, and all other services and supplies had just threatened to stop KBR's work at Camp Speicher -- to stop cooking and feeding the troops, to stop supplying the troops outside the base -- unless the Army paid KBR's submitted invoices. Granted, his company, KBR, a subsidiary of Halliburton, was operating "at risk" by overrunning its budgeted spending and had been late in sending its invoices to the Army. And the Army was slow in paying becasue of its concerns over the accuracy of the company's invoices. Even so, the KBR manager had just threatened the Army brass that his employees were going to stay in their housing containers and do nothing until the money was paid. Essentially, this would amount to a work stoppage, or labor strike, on the battlefield -- perhaps the Army's biggest fear regarding the Pentagon's new experiment of having private contractors supply the basic needs of its troops on the battlefield. The Army manager and his assistant wondered if KBR could really do this. If soldiers or officers tried to pull this same stunt in the old Army, the general would court-martial them, and they could be sent to prison. However, according to federal contracting rules, a company has the right to stop work if that company is risking a large amount of its own money and the government is unable to pay due to funding problems. Clearly, wartime conditions should be an exception when soldiers' lives are on the line, but there is no legal basis for a general to force a company's employees to work beyond the contracting rules. The company or its employees can stop work or go home, and there is nothing that military commanders can do about it, except seek drawn-out legal-contract remedies in the courts back in the United States. The Army logistics contract manager and the camp's general officer faced the disaster of having to explain to their men, their superior officers, and the public that there might not be any food, water, or other vital supplies the next day because the Army didn't have a backup plan. Since the Army had outsources these traditionally Army-provided services to one company, they did not have any choice. The Army was short of troops, so there were no back-up soldiers to take on these tasks. KBR ended up working the next day because the Army ultimately relented and agreed to come up with new money to pay its invoices. But this was not the first or last time the company would threaten the Army with work stoppages. It was like negotiating with the only plumber within a thousand miles when your basement is filling with water. KBR was in the driver's seat, and the company knew it." Private contractors are subject to different legal requirements than soldiers, and they have different sets of incentives to do their jobs. A competent administration would consider, in each case, whether it made more sense to use private contractors or soldiers for a given function, rather than just assuming that the more privatization, the better. This is just one more reason why we should elect Presidents not on the basis of whether we would like to have a beer with them, or whether or not hey seem stiff or sigh audibly during debates, but whether or not they would appoint competent people who will do their jobs well, and who will bring experience and wisdom to their work. I very much hope that we have learned this lesson, since our troops, not to mention the citizens of Iraq, depend on it. Not that it matters to the perpetrators of the September 16 shootings, since the State Department seems to have given them immunity. ** As Nell pointed out, the House has passed Rep. Price's legislation. Clinton’s rivals are contemplating history and deriving only a narrow lesson about Bush: Don’t trust him when he confronts a Muslim country. But the larger, more durable lesson from Iraq is that wars can be caused by a lack of confrontation. The Iraq invasion happened partly because the world had lost the stomach to confront Saddam Hussein by other means. . . . If you believed that a resurgent Saddam Hussein presented an intolerable threat, it was worth taking the risk of unseating him by force, sooner rather than later. Alone among the Democratic candidates, Clinton has the honesty to insist that the case for war was reasonable at the time -- even if, with the benefit of hindsight, the invasion has proved disastrous. In sticking to that politically difficult position, Clinton is saying that, despite its awful risks, war can sometimes be the least bad choice. I seem to remember the war starting for a reason other than a lack of stomach, but anyhoo. Although Mallaby’s smug superiority -- seemingly oblivious to consequences -- is bad enough, there’s a serious point here. It relates back to a theme I’ve been stressing lately -- the inherent (often invisible) pro-war bias within American public and intellectual thought. One aspect of the Iraq debate involved burdens of proof. War opponents -- quite reasonably -- argued from a “presumption of peace.” Because war is such a drastic, deadly, and unpredictable act, opponents argued that war supporters must meet a strong burden of proof. However, war supporters -- aided by people like Mallaby -- subtly shifted the burden of proof. Rather than requiring Bush to “prove his case” in the face of increasingly questionable information, war supporters simply assumed war was the right thing to do and put the burden on opponents to show otherwise. The larger point here is that one manifestation of America’s pro-war bias is this tendency to shift the burden of proof onto those who oppose using war to solve foreign policy problems. Mallaby’s op-ed is a perfect example of this thinking. First, he argues that the Iraq War -- though “disastrous” -- was “reasonable at the time.” It was only reasonable, though, if you assume that all doubt should have been construed in favor of war. I mean, the idea that Saddam was “resurgent” is probably a lie. But even assuming he’s arguing in good faith, the world didn’t stop in October 2002. A steady stream of information -- forgeries, IAEA, etc. -- was streaming in, calling the administration’s claims into question. But at the very least, the disaster that is Iraq should cause Mallaby to rethink his presumptions. Even if you disagreed at the time, Iraq today illustrates the benefits of a presumption of peace -- it’s less a liberal thing than an implication of the limits of human knowledge in the face of the awfulness of war. But here we are again. And Mallaby -- once more into the breech -- has decided to argue that war is still teh awesome, despite the risks. In fact, supporting war in the face of “risks” is bravely “sticking to [a] politically difficult position.” It is often, after all, “the least bad choice.” Well, I can think of a few lesser bad choices. Ones that get a lot less people killed. Lastly, though I doubt it based on his extended defense of the Iraq War, maybe Mallaby really believes sanctions and promises of diplomacy are not “harbingers of war.” Presumably, he was reading the news from August 2002 to March 2003. But he does write on the Post op-ed’s page a lot. So we can’t be sure. "And now, some of our country's richest, largest, most powerful and most well-connected corporations were caught breaking laws that have been in place for decades, such as Section 222 of the Communications Act of 1934, which provides that "[e]very telecommunications carrier has a duty to protect the confidentiality of proprietary information of . . . customers." 18 U.S.C. 2511 makes warrantless eavesdropping a felony; 18 U.S.C. 2702 requires that any "entity providing an electronic communication service to the public shall not knowingly divulge to any person or entity the contents of a communication" without a court order; and 18 U.S.C. 2520 provides for civil damages for any violations." "I have no problem with telecommunications companies being protected from lawsuits brought by those who may or may not have been illegally targeted simply because the Bush Administration refused to update the law." I can only hope that Joe Klein is as willing to defend me the next time I get in trouble simply because the administration has failed to update the speeding laws. "Congress has no intention of investigating any of this, and even if they wanted to -- which they don't -- their subpoenas would simply be ignored and they would do nothing about it. Congress has spent the last six years shutting its eyes towards all of this, except when the White House demanded that it be legalized. These private lawsuits -- brought by heroic privacy and civil liberties groups -- are the only real mechanism left for discovering what the telecoms and our Government have been jointly doing when it comes to spying on our communications, maintaining surveillance data bases of our actions, and violating a whole litany of long-standing federal laws designed to protect the confidentiality of citizens' communications. A law that gives amnesty to telecoms would mean that those lawsuits are stopped in their tracks, and we would likely never find out -- at least not for a long, long time -- the extent of this oversight-less surveillance by our government on Americans, nor would we be able to obtain a judicial ruling as to its illegality." Third, this would set a horrible precedent: when the President, or his administration, asks corporations to do things that violate the law, they can be retroactively immunized from prosecution. I, for one, do not want any President, Democrat or Republican, to be able plausibly to claim that s/he will be able to protect corporations from the law. If they want to change the law, they can introduce legislation and try to get it passed. If a genuine emergency arises in which it's not possible to change the law in time, and only corporate lawbreaking stands between us and Armageddon, we can hope that juries would not convict that corporation, or that judges would be lenient. But setting a precedent whereby Presidents can ask corporations to break the law is not the way to deal with these cases. It gives far too much power to the Executive, and it is dangerous to our republic. Finally, retroactive immunity creates all the wrong incentives for corporations in the future. -- As I see it, the most charitable plausible story one could tell about the telecoms is this: the administration approached them and asked them to turn over information about their customers in violation of the law. The telecoms knew that what the government was asking them to do violated the law -- after all, that's why they hire all those lawyers. Nonetheless, they did not want to go against the administration, on whom they depend for a lot of business, favorable regulations, and so forth. They looked for allies who would give them cover if they refused to comply with the administration's request, but found none: the Justice Department was unwilling to bring this before the FISA court, the Congressional Intelligence Committees, then run by Republicans, were not interested in investigating, and so on. Faced with the prospect of defying the administration on their own, they declined. In a situation like this, the fear of legal penalties is just about the only incentive a corporation has to stay on the right side of the law. With the prospect of legal penalties, a corporation has to weigh the costs of defying the administration against those penalties. Without them, they have no reason whatsoever not to give the administration whatever it asks. Do we really want to create a situation in which the President can ask people or corporations to violate the law, and argue that there is precedent for their being able to do so with complete impunity? No. Do we want to allow corporations with extremely good legal departments to get away with breaking the law, when ordinary lawbreakers are sent to jail? No. Do we want to do more than we have already done to undermine the rule of law? No again. If you agree, then you should consider signing OpenLeft's petition. People for the American Way has a web page that makes it easy to send letters to your Senators; it's here. Thanks. I stayed away from the entire Beauchamp affair. I was aware of it, and I had my own opinion, but since I had no way of proving anything one way or the other, I saw no real value to jumping into the fray. However, an experience I had the other day has left me with the feeling I have little choice but to speak up. As those familiar with the story know, Beauchamp got into trouble over three claims: that he'd made fun of a woman badly scarred by an IED, that he had been present when a soldier placed part of a child's skull on his head and entertained his buddies, and that he had seen a Bradley Fighting Vehicle driver kill numerous dogs without reprisal. At the time, my personal opinion was that the last claim was the least likely, since the positioning of the driver in a BFV would make it difficult to pull off the maneuver Beauchamp described. I still don't know how much of Beauchamp's tales were accurate and how much was fabricated. Nor do I care. But I am going to relate this because I think that the vilification Beauchamp received was much less because what he said might not be accurate and far more because what he said attacked a particular narrative near and dear to the hearts of many of those who support the war in Iraq. I had to get back to my FOB the other night. I was away from my unit, so I hitched a ride. The guys in the HMMWV I rode in seemed like normal soldiers: a bit irreverent, sometimes frustrated, but decent guys. Until we passed through a town and spotted three dogs in the middle of the road. Without hesitation, indeed with genuine glee, the driver accelerated and apparently ran down one of the dogs (in the dark, from my position, all I know for sure is that there was a bump). He then got into a vigorous argument with the gunner over whether or not he had hit the dog; the gunner was attempting to deny him 'credit' for the kill. There was no objection from the vehicle commander over any of this...killing a stray dog didn't seem to faze him in the slightest. Granted, this didn't affect the mission one way or the other, and it was a dog and not a person. Still...I felt a bit ill at the thought the vehicle I'd been riding in probably ran over a dog, and the fact this seemed to bring joy to otherwise normal appearing people remains appalling to me. Does this mean Beauchamp was telling the truth? Nope...I still can't prove that one way or the other. My point in bringing this up is only to note that, whether or not his story was true, soldiers are people, and sometimes people do some pretty unpleasant things. And attacking people who point out that soldiers are people, however cathartic it may be for some, does nothing to change that fact.